In this post, I will present lists of scorers after 19 rounds of the GLO Premier League 2011-2012, as well as some observations. * The talented left-winger / striker Nurudeen Ali (born 16.05.1991) is back at Aduana Stars FC after a rather unsuccessful stint at Berekum Chelsea FC. Aduana Stars FC has also signed striker Edwin Osei Pele (born 17.08.1988) who failed to get a single game at Hearts of Oak SC this season. * Lively attacker Richard Arhin (born 09.11.1991) finally scored his first goal of the season in Round 16. Despite his lack of goals, Arhin has gotten a lot of praise for his performances since joining from the Red Bull Academy. * Nathaniel Asamoah (born 22.02.1990) has left for Crvena Zvezda Beograd (Serbia) and Ahmed Touré (born 17.07.1987) is currently out in the cold because of indiscipline. 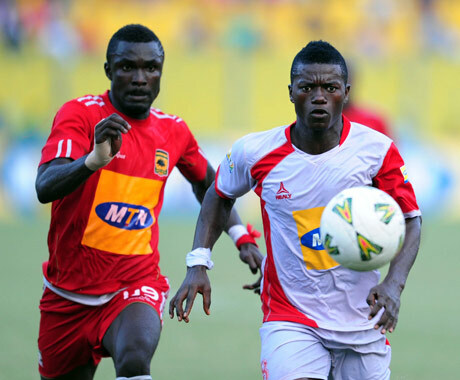 Despite missing their top strikers, Asante Kotoko FC looks unstoppable. Ben Acheampong, formerly of Wa All Stars FC, has done well up front and the talented Prince Baffoe from FC Nania is a truly interesting newcomer. The picture is of Prince Baffoe and is taken from Ghanasoccernet. Defensive midfielder Idrissa Sacko (born 30.12.1991) from Burkina Faso is finally a registered player at the club but he will have to work hard to force his way into the starting eleven. * AshantiGold SC is in top form and has made some wonderful new signings, including midfielder Bernard Akuffo (born 20.12.1986), the former captain of Tema Youth FC, defender Lawrence Lartey from FC Nania, full-back Eric Kwaku Opoku (born 11.11.1991) from Berekum Chelsea FC, left-back Louis Quianoo (born 14.09.1987), formerly of Asante Kotoko FC and striker Nana Poku (born 01.09.1988) from Berekum Chelsea FC. * Prince Arkoh (born 29.12.1990), formerly of King Faisal Babes, has signed for Berekum Chelsea FC after a stint in Egypt and Turkey. Jordan Opoku (born 08.10.1984), the former playmaker of Asante Kotoko FC, last seen at Dinamo Tirana (Albania), should also bring much needed creativity to the midfield of Chelsea. * Bismark Asiedu (born 17.09.1984) finally scored his first goals of the season in Round 16. * Hearts of Oak SC has brought in several new players. Goalkeeper Philemon McCarthy (born 14.08.1983) has been re-registered and his impressive form has forced Sammy Adjei (born 01.09.1980) to the bench. Ahmed Soulama, the left-back from Burkina Faso, is finally registered and has already made a few appearances. Laryea Kingston (born 07.11.1980), the central midfielder with more than 40 full international matches for Ghana, is a wonderful signing. Kingston should be able to bring more people to matches in the GLO Premier League. James Kwame Abban (born 31.07.1988), the top scorer at Liberty Professionals FC, and Edward Affum (born 20.05.1989), formerly of Asante Kotoko FC, has been brought in to make things easier for top striker and wonderboy Mahatma Osumanu Otoo (born 06.02.1992). * Top scorer James Kwame Abban (born 31.07.1988) has left the club but the new Gambian striker Ibrahima Camara seems interesting, especially when forming a partnership with Latif Salifu (born 01.08.1990) with three goals in the last two matches. * Strong striker Tanko Mohammed (born 22.03.1984) is finally registered for struggling Medeama SC. Mohammed was one of the best strikers at Heart of Lions FC before he left for the lower leagues in Spain. * Midfielder Godbless Asamoah (born 06.11.1990), formerly of Kessben FC, looks like a good acquisition. Wassaman United FC has also strengthened their goalkeeping division by bringing in Stephen Ahorlu (born 05.09.1988) from Medeama SC.